India vs Australia Ranchi tickets are in high demand due to less tickets. JSCA ranchi stadium is a newly built stadium of state. It is the home ground of MSD and final match of Australia tour of India scheduled in this stadium. Till now it hosts many matches and all of them were housefull. 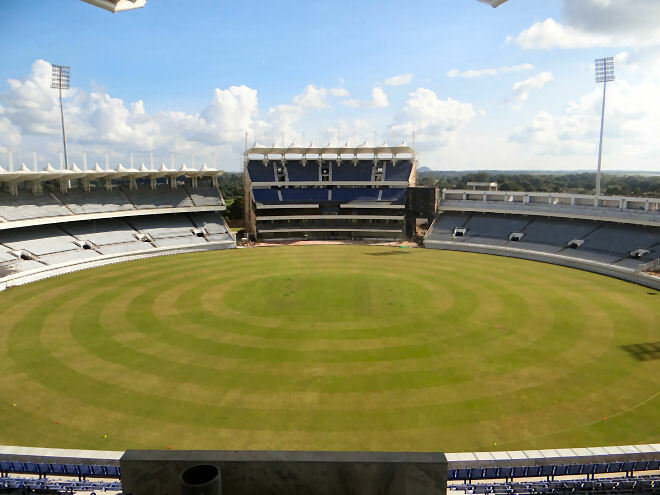 Third match of India vs Australia 5 ODI series will be played at this stadium on 08 March 2019. It is one of the best stadium to watch live international matches. This stadium can host day night matches and India vs Australia Ranchi match is also a day night match. We will share the India vs Australia Ranchi tickets price after the official announcement. The JSCA International Stadium is also known as Ranchi cricket stadium located in Ranchi, Jharkhand. It is a new built cricket ground established in 2010 and it inaugurated in January 2013. Kothari Associates Pvt. Ltd. is the architect of Ranchi Stadium. A complex owned and managed by Jharkhand State Cricket Association. First ODI was played here on 19 January 2013 in which India won the match by 7 wickets with the help of Virat Kohli’s 77 runs knock. Ranchi is the Home Town of Mahendra Singh Dhoni. He was the former captain of Indian Cricket Team. 4th One day international Day Night match between India and New Zealand was played here on 26th October 2016 as a part of 5 ODI match series. Seating capacity of the Ranchi cricket stadium is 40,000 and whole JSCA International Stadium Complex spreads in an area of 130,000 Square meter. Ranchi cricket stadium has hosted 4 ODI, one T20 and some IPL matches till now. Now most of the cricket match tickets are booked through online mode. Online ticket can be booked through insider. Ticket booking procedure generally starts a few days before the scheduled match. We are hoping that the ticket booking for India and Australia few days before the match. We will update the details as soon as sale starts. We are also hoping that the sale of tickets will start in offline mode also (through ticket counter). India Australia 3rd international match is scheduled to play in this Ranchi cricket stadium. This match is the part of Australia tour of India 2019. Ticket booking of India Australia match expected to start a few days before the match. The official announcement is awaited for the sale of tickets. As per previous experience, we are hoping this time tickets will be available in both offline and online mode. As per past experience, tickets might starts from 1000 Rs. 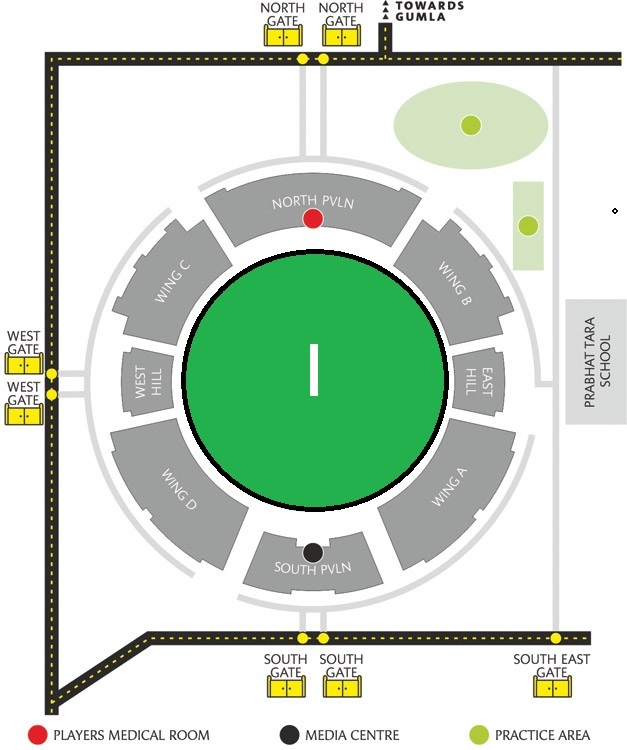 Ranchi stadium seating capacity is 40,000 and the layout is showing the North and South Pavilion. It clearly depicts all the wings and stands for watching cricket match. Entry gates and nearby roads along with cricket players medical room, media centre and practice area are marked on the seating map. Ranchi ground is located just 7 KM away from Birsa Munda airport and Ranchi railway station is just 10 KM away from the Ranchi cricket ground. Stadium is newly built and it has all basic facilities for the convenience of visitors. Washrooms, drinking water is available and the cafeteria serves the food to the visitors at reasonable price. The stadium is located inside the boundary of Ranchi city, so it is advisable to reach here through public transport. During the match opening and closing time the nearby roads get choked due to the crowd. It is advisable to reach the JSCA stadium one to two hours before the scheduled time. Carry only wallet and mobile while going to watch cricket match in Ranchi stadium. Headphones, earphones, data cables, chargers, coins, power banks, water bottles, plastic bags, etc. are not allowed inside the stadium due to security restrictions. Baby foods, diaper and other baby items are allowed in the stadium after proper checking. Kindly avoid carrying restricted items inside the stadium; you might get any surety of safe keeping of these items. I also had to deposit my Philips headphones in an open bucket in the Feroz Shah Kotla stadium during T20 World cup 2016 and they were lost in all the hustle bustle. Official website is cricjharkhand.org. Contact numbers are 0657-2432722, 2233950 and official mail ID is jsca_keenan@rediffmail.com. Disclaimer: All efforts are made to supply the correct information and we are not selling any tickets for the matches. We are just providing information. India Aus T 20 match ka online ticket kay liyea kya karna hoga link bhejiya? As per my knowledge, online ticket booking is not available. Only offline ticket booking is allow.